With 10 wins in a row, eight straight on the road, and three consecutive shutouts, the St. Louis Blues were by far the hottest team in the NHL as of Feb. 18th. This is quite a turnaround for the club which sat in the league basement earlier in the season. They’ve soared up the standings over the past several weeks and are now sitting in third place in the Central Division with their 31-22-5 record. The Blues’ 67 points left them just six behind the second-place Nashville Predators in the division with three games in hand. The playoffs appear in the crystal ball now as St. Louis was holding an eight-point lead over the Vancouver Canucks, who were holding onto ninth spot in the conference. St. Louis has shifted into another gear even without the services of veteran forwards David Perron and Alexander Steen recently as they’re sidelined with an injury and personal reasons respectively. The 30-year-old Perron has 17 goals and 35 points in 45 games while the 34-year-old Steen has struggled in 2018/19 with six goals and 18 points in 42 outings. The 10 victories on the trot tied the franchise record which the Blues set in January of 2002 and they’re two shy of equaling their record of 10 consecutive away wins which was established in 2000. 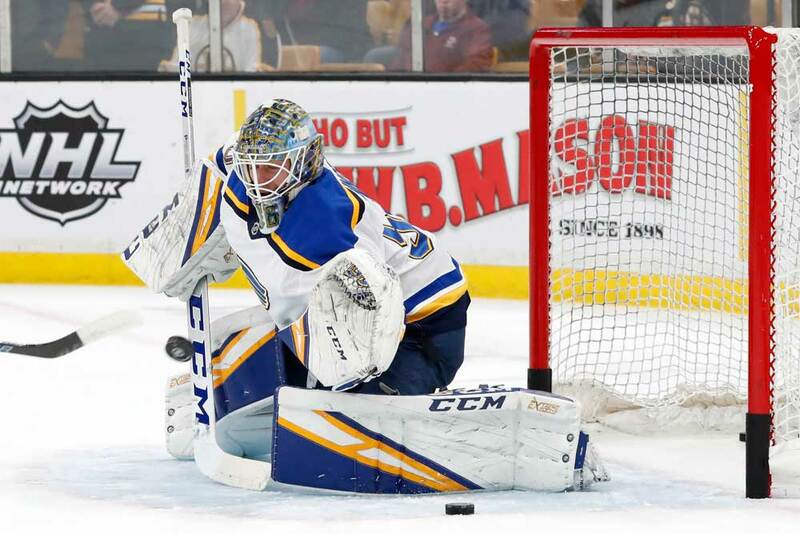 There are a few reasons the Blues are rolling right now with the top two being the play of rookie goaltender Jordan Binnington and veteran forward Vladimir Tarasenko. The 25-year-old Binnington of Richmond Hill, Ontario didn’t make his NHL debut until Jan. 7th and he’s gone 12-1-1 since with a goals-against average of 1.58, a save percentage of 93.7 and four shutouts, which have all come on the road. Fellow netminder Jake Allen should also get some credit as he’s picked up his game lately. The 28-year-old is 17-15-4 on the year with a 2.98 GAA, 90.1 save percentage and a pair of shutouts. His save percentage is going up while his goals-against average is going down though. He’s 134-86-19 in his 257-game NHL career with a 2.55 GAA and 91.1 save percentage and is starting to play to his potential. Allen’s experience could be depended on if Binnington should tire down the stretch or in the playoffs. As for Tarasenko, he’s on a tear with 20 points in the last 10 games, 13 in his past five and on a career-high 12-game point streak. The 27-year-old Russian started slowly this season after undergoing shoulder surgery during the summer, but now has 26 goals and 51 points in 57 games and is on pace for 73 points. It also took Tarasenko a little while to find his groove due to the Blues making a coaching change, a revolving door of linemates and overall sub-par performances from the entire squad. Craig Berube has now had time to work with the players since taking over from Mike Yeo as the bench boss and they’re starting to gel. 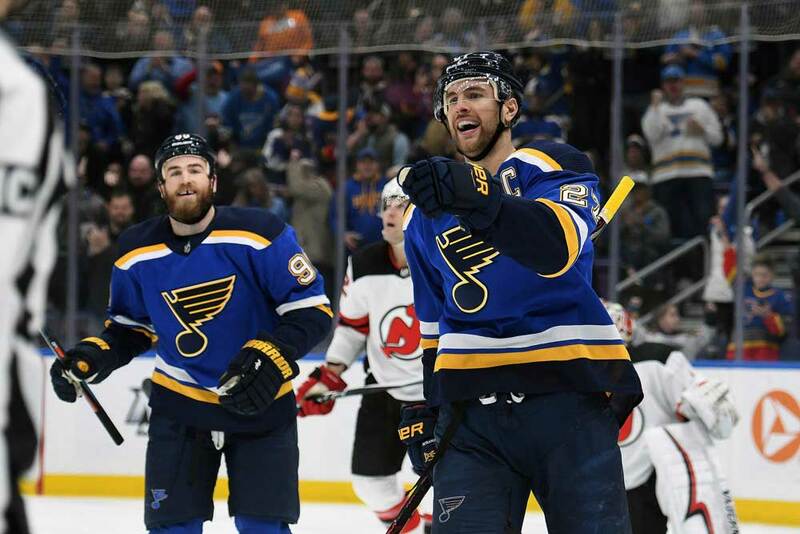 Perron joined the team for his second stint in the offseason and the Blues also acquired several other forwards in Pat Maroon, Ryan O’Reilly and Tyler Bozak. Maroon has just four goals and 16 points in 50 games and is minus-7 while Bozak has posted nine goals, 23 points and a minus-2 ranking. However, O’Reilly is pulling his weight and leading the team in scoring with 22 goals, 60 points and a plus-25 mark. O’Reilly also leads the forwards in ice time at 20:46 minutes on average per game and is one of the best faceoff men in the league. He’s playing in between Tarasenko and Brayden Schenn, who has notched 11 goals and 39 points in 54 contests. The trio has been burning up the track lately with 16 goals and 44 points during the team’s 10-game winning run. When O’Reilly was acquired in a trade with the Buffalo Sabres last year he came over as a solid if unspectacular player and he’s definitely lived up to his billing. His production has been crucial for the Blues since several players are struggling point-wise this year. Schenn, Bozak, Steen and Maroon were all projected to post more points than they have and winger Jaden Schwartz is also having a hard time of it with just five goals and 25 points in 45 games. Tarasenko’s improvement over the campaign has been invaluable and he may surpass his best NHL season of 75 points which he posted in 2016/17. If the Blues can hang on and reach the postseason we should expect to see Tarasenko continue his fine play since he’s scored 22 goals and 32 points for the club in 44 career playoff contests. If the Blues had a better home record they’d probably be close to locking up a playoff spot, but they’re one of the worst squads on their own rink at 14-13-2. But to make up for their lack of success at the Enterprise Center, St. Louis possesses one of the NHL’s best road marks at 17-9-3. When the team has made the playoffs in recent years, the Blues didn’t hang around too long as they’ve made it past the second round just once in their past five appearances. They’ve reached the playoffs in 42 of 51 seasons since joining the NHL in 1967/68, but have yet to win the Stanley Cup. They made it to the Final in their first three seasons, but were swept in all three series by the Montreal Canadiens in the first two tries and the Boston Bruins the third time around. The only team with a longer cup drought is the Toronto Maple Leafs, who lasted hoisted Lord Stanley’s mug in 1966/67. St Louis often appeared to run out of steam in the springtime after posting strong regular season numbers. Things may be different this time around though as they’re peaking down the stretch run and could enter the postseason as one of the league’s hottest teams. If Binnington and Allen can keep stopping the puck, Tarasenko and O’Reilly continue to lead the offense and some of the underachievers start to produce, the Blues could go a few rounds in the postseason.